We spent a few hours in Powell today and had lunch with Rowene Weems, the director of the Homesteader Museum. Turns out she is an avid photographer so we talked cameras for a bit. Back at the museum Sharon spent time copying many of the historic photos they have in their digital archive, so I walked around the town taking photos of all the Heart Mountain related signs. Awning at the Powell Tribune. The mountain is such a presence in the area it becomes an icon that people identify with. The distinctive silhouette of the peak shows up in many logos and signs. 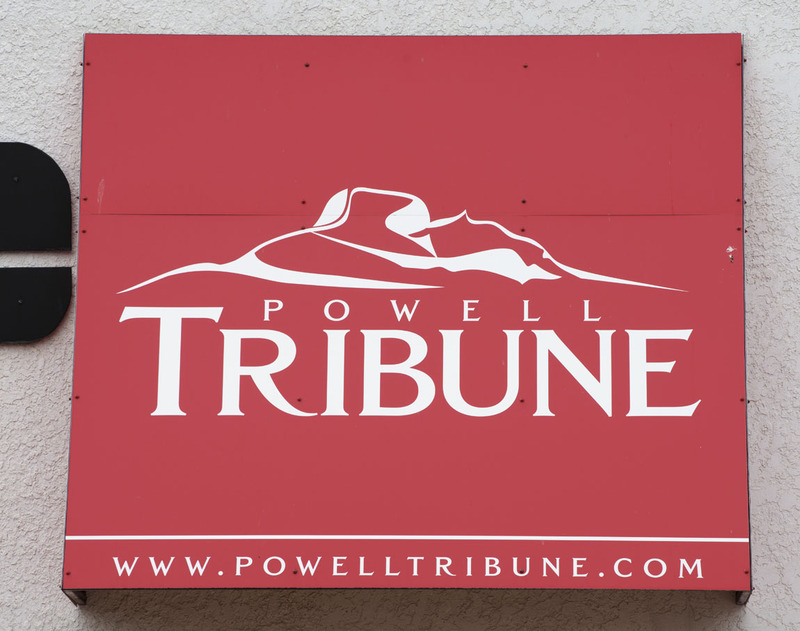 On the masthead and the front of the building of the Powell Tribune is a rendering of the mountain. I’ll post more in the next few days. 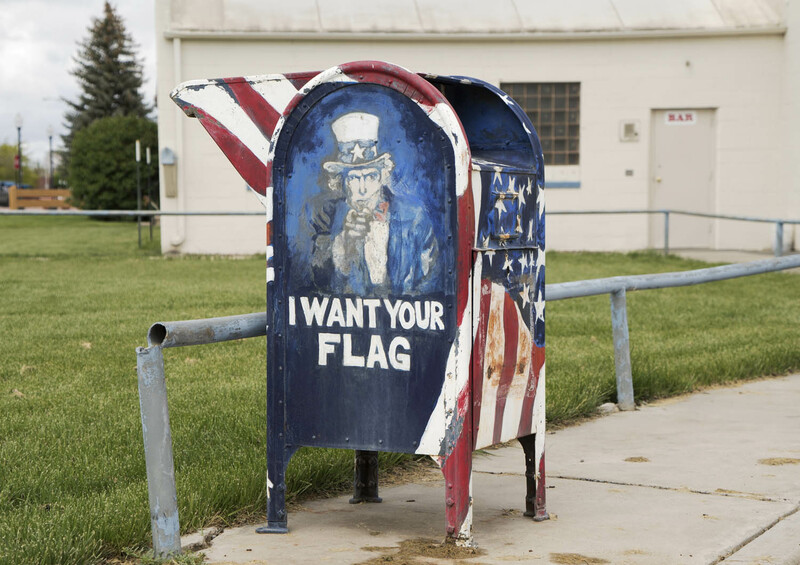 We had seen this mailbox earlier in the day outside the American Legion Hughes-Pittinger Post #26 and I returned to photograph it. 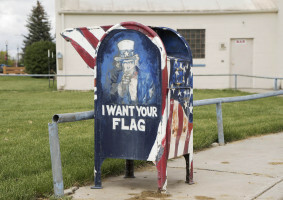 Turns out it is not a mailbox, but a collection box for flags. Inside the door at the top of the box it states, “Not a mailbox”. The sun, which we hadn’t seen in days, began to peak out from the clouds, so we took advantage and headed out to photograph the Bright homestead, where we were yesterday. They have a really whimsical sign hanging from a tree as you enter the property, calling their land, Bright Acres, Homesteaded 1949. (See top photo). 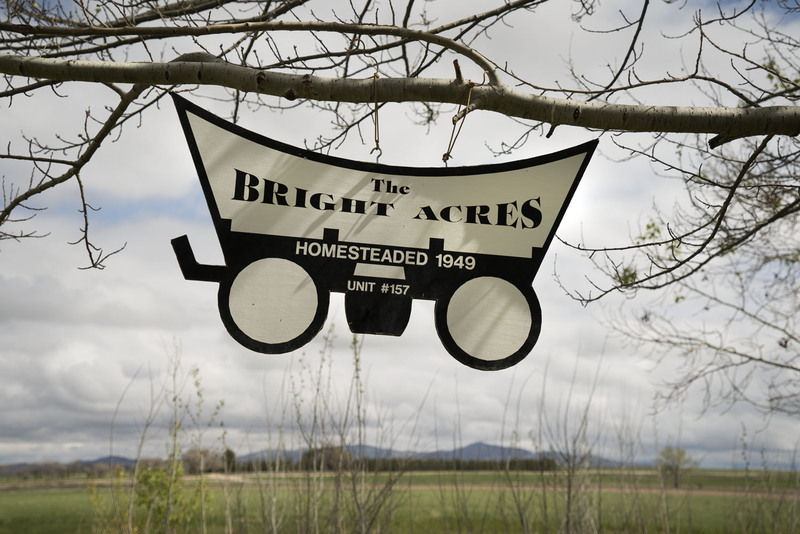 In the whole scheme of things 1949 doesn’t sound very old, but the date is significant since it means they were one of the original Heart Mountain District homesteaders. 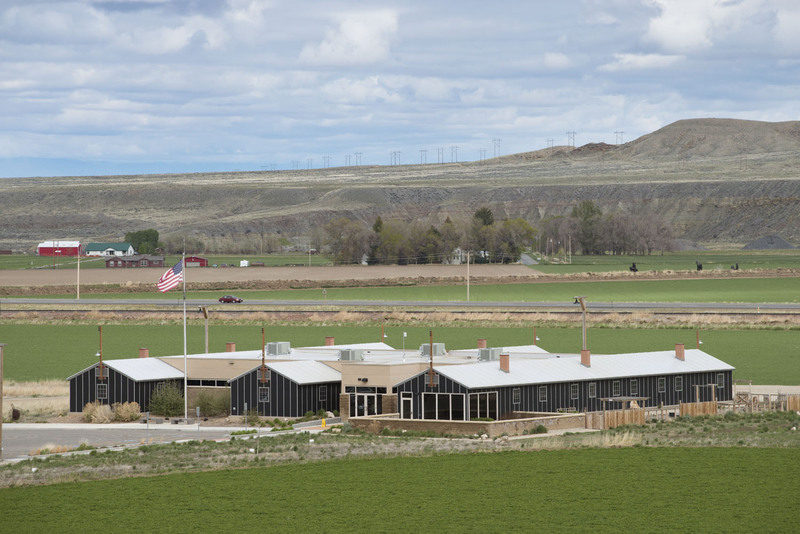 The Heart Mountain Interpretive Center. 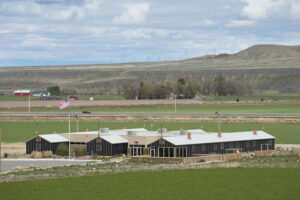 I’ve mentioned the Heart Mountain Interpretive Center but haven’t shown a photo of the whole building. It’s quite striking, resembling three barracks in a row in the dimensions of the original structures. This view to the southeast towards highway 14A give you an idea of the size of the museum and the setting among the farms on either side of the road. It’s a remarkable center and well worth seeing.